Cooking has always been my passion and it is rewarding to see that my family enjoys eating what I cook for them. My husband also loves to cook – roasting is his favorite – and I love to bake. Thus, we make the perfect tandem – he roasts the main meal, and I bake dessert. Now, one of my favorite desserts to bake is banana bread. Due to my OCD-ness of wanting perfectly moist banana bread, we put in time and effort to find the perfect cooling rack. We were in desperate need of a rack that we can use to roast, grill, and bake but won’t warp or flake off. We scoured online and superstores but the wire racks were either too thin, not rust-proof, too low, or all of the above. It was during one of our bedtime chats that the idea for the Kitchenatics Cooling and Baking Rack was born. My husband took over the research, going through podcasts, Amazon seller forums, and articles online. It wasn’t an easy journey – we had our ups and downs. Minor disagreements such us packaging, font colors, and rack details – they would make me really mad at times. However, it was all a funn and rewarding experience. Especially when we finally held our first set of the Kitchenatics Cooling and Baking Rack after 4 months of hard work, perseverance, and dedication. The first time we held our products in our hands, it was like having a newborn baby again…okay, so I’m getting emotional… LOL! Anyway… we now have our very own cooling and baking rack and it’s time to bake the family’s all-time favorite banana bread! Now, I’d just like to brag about this—the banana bread comes out PERFECT – EVERY TIME! The secret? I bake it in the baking pan then let it sit for about 5 to 8 minutes. After that, I transfer it to the cooling rack. The result? Perfectly moist banana bread with no dark bottom. In a bowl, mix the flour, baking soda, salt, and cinnamon. In a separate bowl, beat the eggs, and add the sugar until it becomes light. Gradually add the butter in the mixture, followed by the mashed banana, sour cream and vanilla. Slowly stir in the dry ingredients until becomes smooth. Finally, fold in the nuts and chocolate morsels. Spread evenly into the prepared pan. Bake it for 350F (175C) for about 45 min to 1 hour. Check by sticking it with a toothpick — if it comes out clean, that means it’s done. Once done, take it out of the oven and let it sit for 5 to 8 minutes in the pan and then transfer it to the cooling rack. Note: For this recipe, I baked it for 45 minutes and it comes out to my desired texture and moisture. The boys loved it! 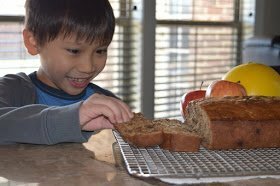 My youngest son who is the banana bread monster couldn’t help eating it. Now, it is a part of my weekend routine. The OCD in me keeps on modifying it to achieve a better and tastier banana bread. Enjoy!